A stellarator record for "triple product"
Wendelstein 7-X | A stellarator record for "triple product"
There is news of success from Wendelstein 7-X, where a record "triple product" value for stellarators was obtained during the most recent experimental campaign. The new graphite tile cladding at Wendelstein 7-X permits higher termperatures and longer plasma discharges. 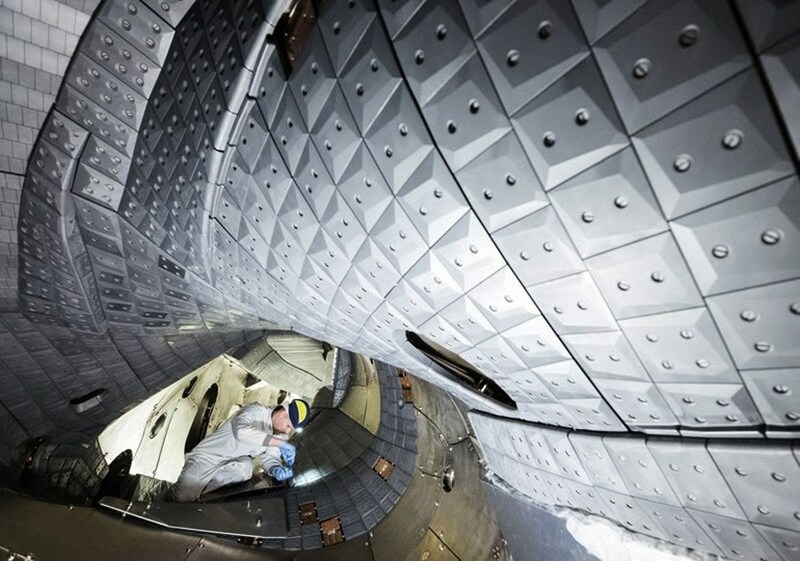 Newly equipped with 8,000 graphic wall tiles and ten divertor modules, Wendelstein 7-X resumed operation in September 2017, ready for higher plasma temperatures and longer discharges. The first experiences with the new wall elements were highly positive, according to Thomas Sunn Pedersen, head of the Stellarator Edge and Divertor Physics group. Plasmas lasting 26 seconds (up from six during the first campaign) and 75 MJ (18x higher) were routinely produced. As a result, a record value for fusion triple product (a plasma's particle density, energy confinement time, and ion temperature) was achieved. This parameter tells scientists how close they are getting to the values needed to "ignite" the plasma and have it become completely self-sustaining (i.e., without external heating). Further adjustments to the device's diagnostic and heating systems are planned. The objective of Wendelstein 7-X is to investigate the suitability of the stellarator type of fusion device for a future power plant. Read the article published on the website of the Max Planck Institute for Plasma Physics (IPP).